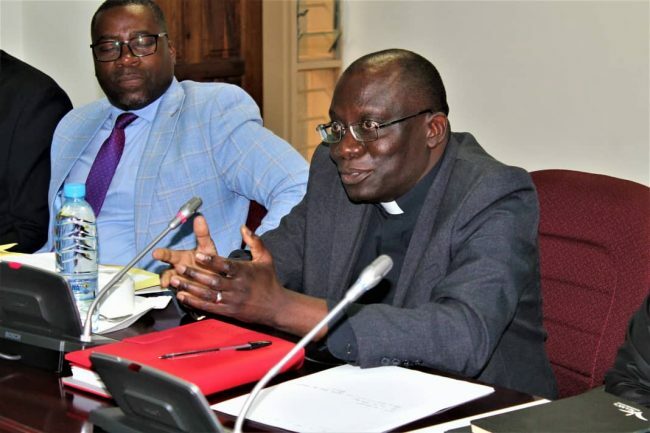 The three church mother bodies have said they will not be part of the National Dialogue Forum that the Patriotic Front (PF) and its surrogate organisations are pushing to review the constitution , Electoral Process Act and the Public Order Act. 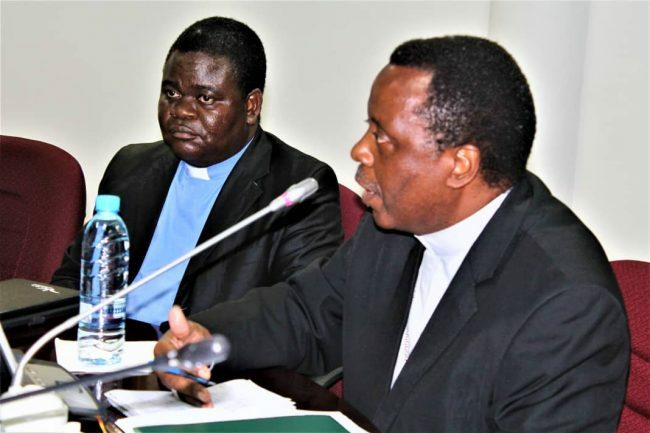 Making a presentation to the Parliamentary committee this morning the three Church mother bodies expressed shock that the Ministry of Justice had listed the organisations among those that had made suggestions of review when in fact they never did. The Zambian Government has proposed to enact into law a bill on National Dialogue (Constitution, Electoral Process, Public Order and Political Parties). This draft bill proposes to establish a Dialogue Forum to make amendments to the 2016 Constitution, the Electoral Process, the Public Order Act and Political Parties bill, premised on the Siavonga resolutions of political parties. At the outset we would like to state that we the three Church Mother Bodies have been facilitating a process of National Dialogue and Reconciliation which speaks to socio-economic, political, cultural and religious issues. While we appreciate the fact that this bill attempts to give legal backing to the process of constitutional amendments and legal reforms, we are concerned that the bill itself does not recognise or take into account the efforts being made by the Church. Thus far we have conducted wide consultations with various stakeholders such as political party leaders, Civil Society Organisations, Media, Labour Unions and other religious mother bodies. Arising from our consultations we have developed a comprehensive National Dialogue and Reconciliation Framework as well as guidelines for the proceedings of the process and terms of reference for different administrative organs of the Framework, such as the Technical Working Groups and committee of experts. All these efforts are aimed at promoting reconciliation, peacebuilding and national healing. In the light of the foregoing, our impression is that the bill is giving extremely short time (ten days) which robs the whole process of a meaningful and comprehensive, constitutional, institutional and legal reforms. 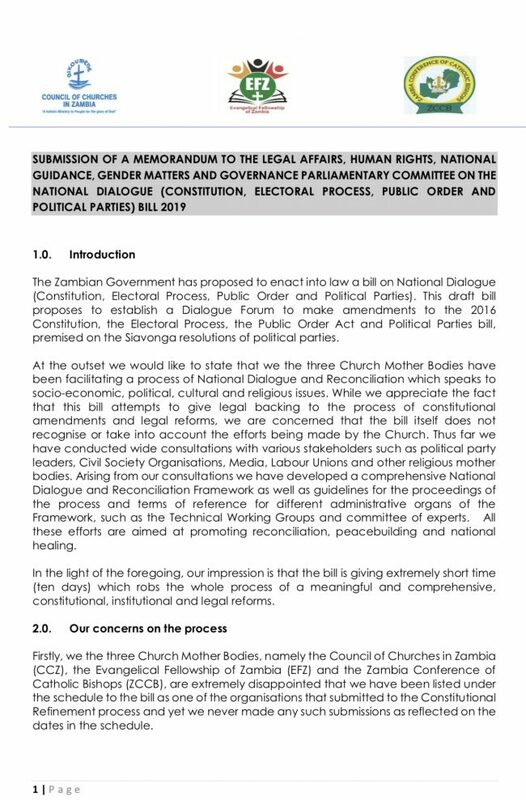 Firstly, we the three Church Mother Bodies, namely the Council of Churches in Zambia (CCZ), the Evangelical Fellowship of Zambia (EFZ) and the Zambia Conference of Catholic Bishops (ZCCB), are extremely disappointed that we have been listed under the schedule to the bill as one of the organisations that submitted to the Constitutional Refinement process and yet we never made any such submissions as reflected on the dates in the schedule. Secondly, we are concerned with the manner and speed with which the bill has been introduced. No sufficient time has been given for stakeholders to study, consult among themselves and have enough time for them to prepare substantial and comprehensive submissions to this committee. Thirdly, the bill does not provide a guarantee for the protection of the contents that will be generated by the proposed National Dialogue Forum (NDF), because it will be subjected to further parliamentary deliberations and scrutiny. 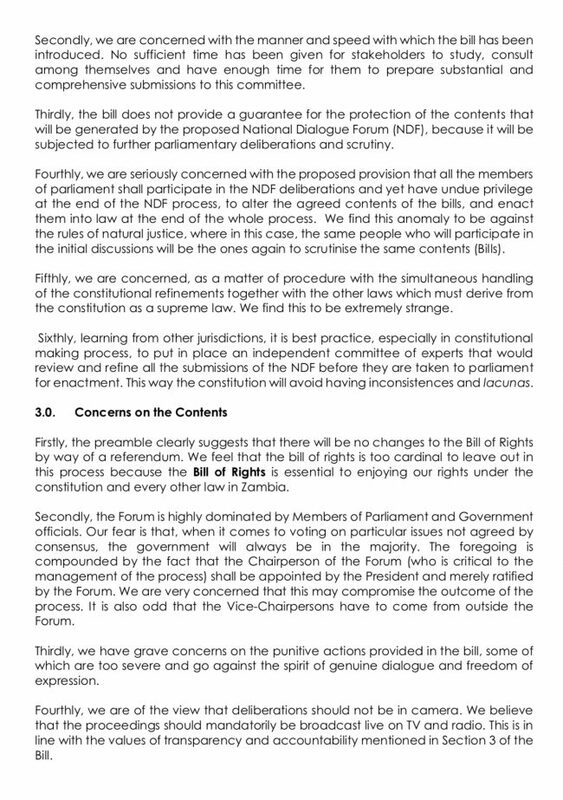 Fourthly, we are seriously concerned with the proposed provision that all the members of parliament shall participate in the NDF deliberations and yet have undue privilege at the end of the NDF process, to alter the agreed contents of the bills, and enact them into law at the end of the whole process. We find this anomaly to be against the rules of natural justice, where in this case, the same people who will participate in the initial discussions will be the ones again to scrutinise the same contents (Bills). Sixthly, learning from other jurisdictions, it is best practice, especially in constitutional making process, to put in place an independent committee of experts that would review and refine all the submissions of the NDF before they are taken to parliament for enactment. This way the constitution will avoid having inconsistences and lacunas. Secondly, the Forum is highly dominated by Members of Parliament and Government officials. Our fear is that, when it comes to voting on particular issues not agreed by consensus, the government will always be in the majority. The foregoing is compounded by the fact that the Chairperson of the Forum (who is critical to the management of the process) shall be appointed by the President and merely ratified by the Forum. We are very concerned that this may compromise the outcome of the process. It is also odd that the Vice-Chairpersons have to come from outside the Forum. Thirdly, we have grave concerns on the punitive actions provided in the bill, some of which are too severe and go against the spirit of genuine dialogue and freedom of expression. Fourthly, we are of the view that deliberations should not be in camera. We believe that the proceedings should mandatorily be broadcast live on TV and radio. This is in line with the values of transparency and accountability mentioned in Section 3 of the Bill. Fifthly, we find it strange that under Section 19, the President is given the power to dissolve the Forum before it has completed its work. This completely undermines the purpose of this whole process. The real danger is that due to political interference, members of the Forum will not be free to debate in case they say something the President doesn’t like. 1. We strongly recommend that the process of National Dialogue and Reconciliation be delinked from the proposed NDF and be left to a competent, neutral and credible mediators. 2. Sufficient time should be given for internal and external stakeholder consultation for effective engagement in this process. 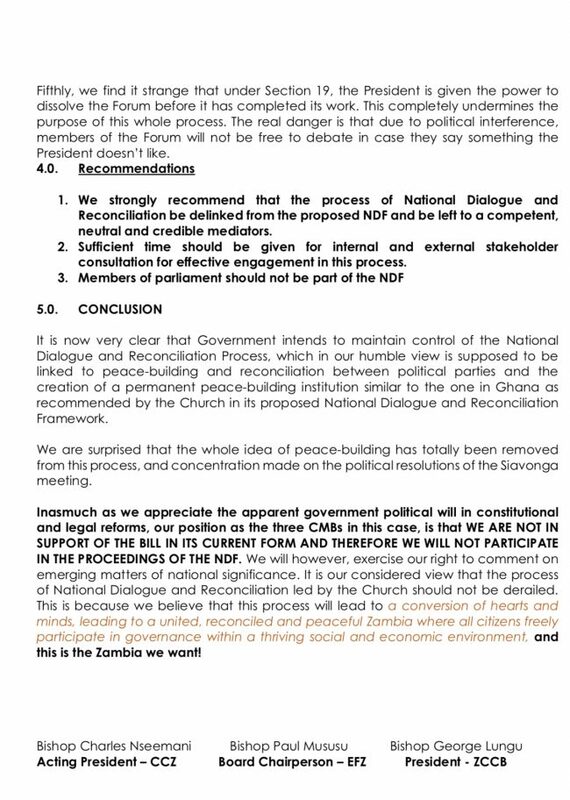 It is now very clear that Government intends to maintain control of the National Dialogue and Reconciliation Process, which in our humble view is supposed to be linked to peace-building and reconciliation between political parties and the creation of a permanent peace-building institution similar to the one in Ghana as recommended by the Church in its proposed National Dialogue and Reconciliation Framework. We are surprised that the whole idea of peace-building has totally been removed from this process, and concentration made on the political resolutions of the Siavonga meeting. Inasmuch as we appreciate the apparent government political will in constitutional and legal reforms, our position as the three CMBs in this case, is that WE ARE NOT IN SUPPORT OF THE BILL IN ITS CURRENT FORM AND THEREFORE WE WILL NOT PARTICIPATE IN THE PROCEEDINGS OF THE NDF. We will however, exercise our right to comment on emerging matters of national significance. It is our considered view that the process of National Dialogue and Reconciliation led by the Church should not be derailed. This is because we believe that this process will lead to a conversion of hearts and minds, leading to a united, reconciled and peaceful Zambia where all citizens freely participate in governance within a thriving social and economic environment, and this is the Zambia we want!